Welcome to the book of hypersudoku, the fun sudoku variant with a distinctive grid design. The aim of the puzzle is to place the numbers 1 - 9 once in each row, column and 3x3 box - this includes the four grey boxes. 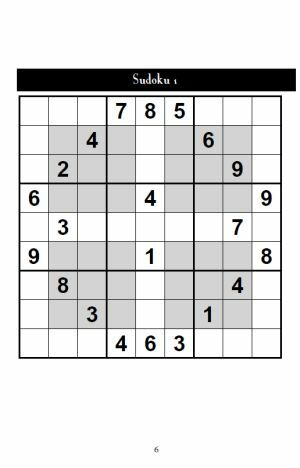 Solve the puzzles just like normal sudoku puzzles BUT with one extra thought: the key to solving most of the puzzles is to make use of the four additional grey box regions that appear in the puzzle and applying the usual sudoku solving rules to those regions. 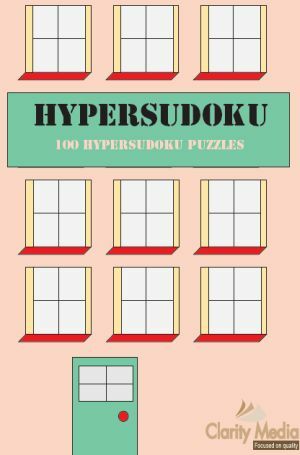 Hypersudoku puzzles also have some other names: these include windoku, because it looks like the puzzle grid has four windows in it, and also extra regions sudoku: the latter because, well, it is a sudoku but with four extra regions in it. Like many extra regions variants of sudoku, such as sudoku X, the key to being able to solve the puzzles is to remember to pay attention to the extra regions. Windoku has 31 regions, not 27, and the new four are demarcated by the grey boxes that you see in the grid: since these must also contain 1-9 once only, you will tend to find that there are less given numbers in the sudoku grid. This is because more information can be derived from these regions than with a normal sudoku in terms of how it restricts the options for squares, meaning that less information is needed in the start position. Each hypersudoku can be solved logically, so if you ever get stuck, take a careful look at your pencilmarks, particularly with regard to the grey regions, as it is often here that people forget to look or miss something as they are less familiar looking at these regions than they are with the standard 27 regions. If you've got any top tips on solving these puzzles then please do let us know and we'll add them to the site, or perhaps ideas for other sudoku variants you'd like to see us publish - again if so, please do tell us!